If your congregation is interested in a bulk order, email me and we can talk about how to make that work. I’m happy to share the pdf source files so you can print your own copies. For many years now, we at Congregation Beth Israel have used a looseleaf machzor created by Reb Jeff (a.k.a. Rabbi Jeff Goldwasser) called B’Kol Shofar. And also for many years, I’ve been supplementing that machzor with handouts, additions, and extra pages. A few years ago I began writing and collecting High Holiday material — poems, prayers, different renderings of classical liturgy — with the hope of compiling a machzor which would incorporate both the basic framework and many transliterations and translations from B’Kol Shofar which have become familiar and beloved to me and to our community, and all of the new material I’ve been collecting, hopefully stitched together with an invisible and light editorial touch. I wanted the machzor to be visually beautiful. Days of Awe features original artwork and photographs (some contributed by artists from my congregation, among them photographer Len Radin, artist Heather Levy, and papercut artist Anna Kronick; some from other artists, among them woodcut artist Loren Kantor, soferetJulie Seltzer, printmaker and jewelry artist Jackie Olenick, and rabbinic student Salem Pearce) as well as what I think is a pleasing and readable layout. I wanted the machzor to be user-friendly. Days of Awe features transliterations of everything which my community does aloud (and then some), and translations of absolutely everything, along with clear directions on where to turn next. Whether you’re a lifelong high holiday afficionado or attending your first Rosh Hashanah or Yom Kippur service, this book will help you through. Days of Awe was created with the needs of my own community in mind, but I hope that it will suit other communities as well, and I’m honored that a few other communities are already planning to use it for their high holiday services this year. Days of Awe is a not-for-profit endeavor, a labor of love given freely to my local community and to the Jewish world at large. I’m a proponent of remix culture, and I believe that every new prayerbook is at heart a remix, bringing a beloved old text into renewed life. Over the last few years I’ve contacted the poets, artists, and liturgists whose work I hoped to include, and received their permission to use their work in this way, as long as I kept to my intention of selling the book at cost. No profit is made: I’m charging exactly what it costs to print and bind. A list of sources / credits appears at the back of the book, so you can see which artist is responsible for each illustration and photograph and piece of calligraphy, and so you can look up the source for each written poem or meditation. This project has consumed an uncountable number of hours over the last few years. I am so proud of the end results, and so pleased to be able to share them with all of y’all. If you use the machzor, either in your community or at home alone, please let me know what it’s like for you — I welcome feedback of all kinds. The book had a team of proofreaders, and had gone through more than 30 printed revisions before I released it, but I knew that once it was used in realtime — “pray-tested,” as it were — I would find things which needed to be updated. I included a new aleinu variant, and a Shaker-inspired Ahavah Rabbah. (I learned both of these from Rabbi David Ingber of Romemu.) I replaced some art which hadn’t printed well with new art which reproduces better. I added more poetry. Some is my own (like the trio of new poems for the shofar service, inspired by teachings from Rabbi Daniel Siegel and from Reb Zalman z”l), some is by other writers. I added a second option for the Torah blessings, so that people now have the option of the classical wording or a more inclusive variation. I made about 50 changes, based on my own impressions of leading davenen with this volume, my student hazzan‘s impressions, and the feedback I received from those who used the pilot edition both inside and outside my own community. After leading davenen with the second edition, I made still further revisions! As of summer 2017, a new edition is now available (the links on this page will take you to the latest edition.) Also as of summer 2017, the new edition has a blue cover, to make it easily distinguishable from the prior editions. I’m happy to make the source files available if you want to print and bind your own copies… with two stipulations: 1) Please don’t sell the books anywhere at a profit, since the rabbis, artists, and poets who donated their work to this project did so on the understanding that no profit would be made from their work; and 2) If you use the machzor, either on your own or in community, please drop me a line after the holidays to tell me what worked for you and what didn’t. The creation of new liturgy is iterative. I know that this second edition is as perfect as I can make it — and I also know that I’ll continue discovering things I want to improve. For now, I’m deep in preparations for this year’s holiday services, and I’m looking forward to using this second edition as I join with our student hazzan in leading prayer. For all that is meritorious in this machzor I thank my teachers; any remaining imperfections in this machzor are my own. Available at Amazon $8.65 L to R binding (paperback) | Available at Lulu $8.74 R to L binding (paperback) | PDF files available upon request. 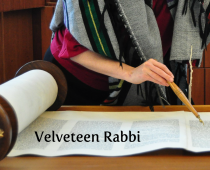 Rabbi Rachel Barenblat blogs at http://velveteenrabbi.blogs.com/blog/.